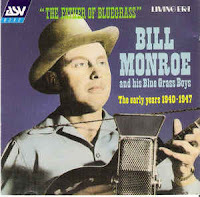 Thanks to John Nyhan for the news that he will be presenting a talk, 'Bill Monroe - The Father of Bluegrass - his life and music' this coming Friday, 13 October, from 11.00 a.m. to 12.00 noon in the Rory Gallagher Music Library, 57-61 Grand Parade, Cork city. Everyone is welcome, not just lovers of bluegrass only, as Bill Monroe - as well as being a member of the Bluegrass Hall of Fame - is also a member of the Country Music Hall of Fame and the Rock & Roll Hall of Fame. For further details, 'phone 087 792 1771 or e-mail John.